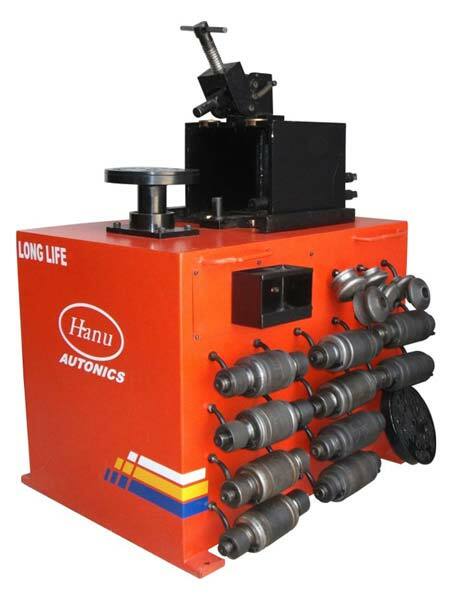 Hanu Autonics Pvt. Ltd. offers an extremely reliable, low maintenance and highly accurate Rim Straightening Machine HRS-330. There is always a possibility of deforming of rim while removing the bend of the collar of rim with the help of Single die whereas in our machine Double die from the outside and small single dies at both of the collar from inside put uniform pressure on the rim and there is no possibility of deforming the rim. Bends in heavily damaged rim can be removed and straightened accurately with the help of our Rim Straightening Machine HRS-330. To meet the different needs of clients, we provide Die attachment of 3.5”, 4”, 4.5”, 5”, 5.5”, 6” and 6.5” Rim Width, in pairs along with our Rim Straightening Machine HRS-330.